hDepartment of Diagnostic Imaging (J.L.B. ), Rhode Island Hospital and Alpert Medical School of Brown University, Providence, Rhode Island. BACKGROUND AND PURPOSE: Contrast agent extravasation through a disrupted blood-brain barrier potentiates inaccurate DSC MR imaging estimation of relative CBV. We explored whether incorporation of an interstitial washout rate in a leakage-correction model for single-echo, gradient-echo DSC MR imaging improves relative CBV estimates in high-grade gliomas. MATERIALS AND METHODS: We modified the traditional model-based postprocessing leakage-correction algorithm, assuming unidirectional contrast agent extravasation (Boxerman-Weisskoff model) to account for bidirectional contrast agent exchange between intra- and extravascular spaces (bidirectional model). For both models, we compared the goodness of fit with the parent leakage-contaminated relaxation rate curves by using the Akaike Information Criterion and the difference between modeled interstitial relaxation rate curves and dynamic contrast-enhanced MR imaging by using Euclidean distance in 21 patients with glioblastoma multiforme. RESULTS: The bidirectional model had improved Akaike Information Criterion versus the bidirectional model in >50% of enhancing tumor voxels in all 21 glioblastoma multiformes (77% ± 9%; P < .0001) and had reduced the Euclidean distance in >50% of enhancing tumor voxels for 17/21 glioblastoma multiformes (62% ± 17%; P = .0041). The bidirectional model and dynamic contrast-enhanced-derived kep demonstrated a strong correlation (r = 0.74 ± 0.13). On average, enhancing tumor relative CBV for the Boxerman-Weisskoff model exceeded that for the bidirectional model by 16.6% ± 14.0%. 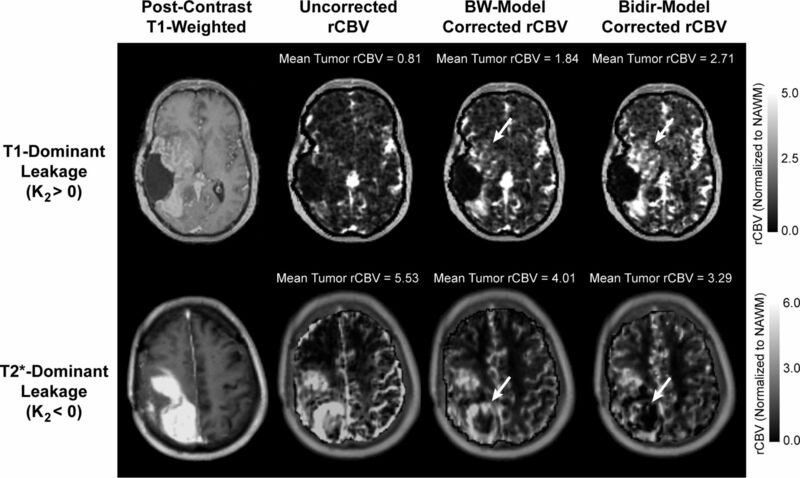 CONCLUSIONS: Inclusion of the bidirectional exchange in leakage-correction models for single-echo DSC MR imaging improves the model fit to leakage-contaminated DSC MR imaging data and significantly improves the estimation of relative CBV in high-grade gliomas. A popular model-based DSC MR imaging leakage-correction method proposed by Weisskoff and Boxerman2,18,19 linearly fits measured ΔR2*(t) to 2 constant functions derived from the average relaxation rate in nonenhancing tissue, one of which is permeability-weighted. Deviation from the reference function is used to derive corrected rCBV for each voxel. A limiting assumption of this approach is that contrast agent reflux from the interstitial space back to blood plasma is negligible within the time frame of DSC MR imaging signal acquisition (∼2 minutes). However, standard models quantifying contrast agent exchange between blood plasma and the interstitium (ie, DCE MR imaging14) use 2-compartment pharmacokinetics to account for bidirectional transport of contrast agent. We hypothesized that incorporating bidirectional contrast agent transport into the original DSC MR imaging signal model improves rCBV estimates in brain tumors. To test this hypothesis, we compared model-based DSC MR imaging leakage-correction methods with and without consideration of bidirectional transport by using simulations and clinical application to high-grade gliomas. We studied 24 sequential patients with histologically proved glioblastoma multiforme (GBM) treated with maximal surgical resection followed by radiation therapy and concurrent temozolomide and both DSC MR imaging and DCE MR imaging performed at initial tumor progression. Of these, 2 patients illustrated no bolus of contrast during the DSC acquisition and 1 DSC dataset was corrupted by significant motion. Thus, 21 patients (15 men; mean age, 54 years; range, 30–73 years) were included in the final cohort. Progression was defined prospectively by the treating neuro-oncologists if subsequent scans showed >2 sequential months of increasing contrast enhancement and worsening mass effect or evidence of neurologic decline. Specifically, progression was defined as ≥25% increase in the sum of enhancing lesion volumes, new enhancing lesions of >1 cm in maximum dimension, an unequivocal qualitative increase in nonenhancing tumor, or an unequivocal new area of non-contrast-enhancing tumor. Additionally, progression must have occurred >3 months following completion of radiation therapy. All participants gave informed written consent to have both DSC MR imaging and DCE MR imaging data collected. All procedures complied with the principles of the Declaration of Helsinki and were approved by the institutional review board at University of California, Los Angeles. We retrospectively reviewed DSC MR imaging and DCE MR imaging scans (3T, Magnetom Trio or Magnetom Skyra; Siemens, Erlangen, Germany), acquired in the same scan session in all 21 patients. T1 maps were generated from 5 precontrast T1-weighted images (flip angles = 5°, 10°, 15°, 20°, 30°) before DCE MR imaging (3D spoiled gradient-echo sequence, 16 sections, 130 time points, 5-second time resolution, TE/TR = 1.87/5 ms, 25° flip angle, 3-mm section thickness, 256 × 192 matrix, 24-cm FOV). The DCE MR imaging was acquired for ∼10 minutes, which was the waiting time between preload and DSC contrast injections for this study. Contrast agent bolus (0.1 mmol/kg) (gadopentetate dimeglumine, Magnevist; Bayer HealthCare Pharmaceuticals, Wayne, New Jersey) was injected after 10–13 baseline images, serving as a preload13 for DSC MR imaging (gradient-echo EPI, TE/TR = 32/1840 ms, 35° flip angle, 120 time points, bolus injection after 20–25 baseline images, 9–20 sections, 5-mm section thickness, 128 × 128 matrix size, 24-cm FOV). The same amount of contrast agent was used for the DSC MR imaging studies. Conventional postcontrast T1-weighted imaging was subsequently performed. Patients were excluded if DCE MR imaging or DSC MR imaging was corrupted by motion or technical error. All conventional and DCE MR images for each subject were registered to baseline DSC MR images by using a 12-df affine transformation with a mutual information cost function (FSL; http://www.fmrib.ox.ac.uk/fsl). If required, manual alignment was subsequently performed (tkregister2, Freesurfer; http://surfer.nmr.mgh.harvard.edu/). Contrast-enhancing tumor ROIs were defined in 3D by using custom scripts (Analysis of Functional Neuro Images [AFNI]; http://afni.nimh.nih.gov/afni), excluding hemorrhage, large vessels, and central necrosis, followed by manual editing to exclude nonlesion voxels.20 Tumor sizes ranged from 2.8 to 106.6 mL, with an average enhancing volume of 40.1 ± 28.4 mL. Spheric ROIs of 1.6 mL were also selected in normal-appearing, contralateral white matter for rCBV normalization. All simulations and calculations were performed in Matlab (MathWorks, Natick, Massachusetts) by using custom scripts. Uncorrected rCBV was calculated from trapezoidal integration of the original DSC MR imaging relaxation rate–time curve, ΔR̂*2(t). The whole-brain average relaxation rate for nonenhancing voxels (Equations 3 and 4, all equations are in the Appendix) was used for both the original Boxerman-Weisskoff model19 (BW model) and the new bidirectional exchange model (bidir model). Linear least-squares optimization was used to determine the free parameters for both the bidir-model (via Equation 7) and the BW model (Equation 5, with kep = 0) algorithms, and the corrected rCBV was computed from Equation 8. The average run-time per patient in Matlab was 19.5 ± 6.7 seconds for the bidir model and 18.3 ± 6.2 seconds for the BW model (3.2-GHz Intel Core i5, 32 GB RAM). Tumor rCBV for each method was subsequently normalized to median rCBV within the normal-appearing white matter ROI. The whole-brain average relaxation rate, ΔR̄*2(t), was chosen from a sample patient and corresponds to the curve with K1 = 1, K2 = 0, and kep = 0. K2 = 0.05 (adding T1-dominant leakage) with kep = 0 was set to simulate the BW model. A nonzero kep (0.002 or 0.005) was used to simulate the bidir model of ΔR̂*2(t). For kep = 0.1, the simulation is reflective of the correction of relaxation rate curves at “arterylike” voxels. where n is the number of fitted time points (injection to the end of the DSC MR imaging acquisition), RSS is the sum of the squared residuals, and p is the number of free parameters (2 for the BW model, 3 for the bidir-model).21 Differences in the BW model and bidir model AIC were calculated for all voxels with kep > 0. We also computed the Euclidean distance (square root of the sum of the squared differences) between the interstitial leakage relaxation rate curves, ΔR*2,E(t), generated by the BW model and bidir model corrections and the DCE MR imaging signal, in which the DCE MR imaging signal was upsampled from a 5-second resolution to a 1.8-second resolution to match that of the DSC MR imaging data via linear interpolation by using the Matlab function “resample.” Because interstitial leakage relaxation rate curves and DCE MR imaging signals have units of 1/s and mM, respectively, both were standardized to an area under the curve equal to unity and were vectorized for computation of the Euclidean distance. Higher AIC and Euclidean distance imply worse fits. Two-sample t tests were used to compare whether the AIC and Euclidean distance measurements were significantly different between the 2 leakage-correction methods. DCE MR imaging biomarkers, kep and contrast transfer coefficient (Ktrans), were derived via a fit to the model of Tofts and Kermode.14 As described, the temporal resolution of the DCE MR imaging data was upsampled to match the DSC MR imaging data. For the DCE MR imaging analysis, the “whole-brain average” served as the arterial input function for the DCE model fit. This was done to mirror the DSC bidir model analysis, in which the “whole-brain average” effectively serves as the arterial input function. Voxels with highly fluctuating time courses in either the DSC or DCE images were eliminated from the analysis. DSC MR imaging biomarkers, kep and rCBV, were derived as described in the Appendix. Voxelwise Pearson correlation coefficients between the DSC- and DCE-derived parameters were performed in Matlab within contrast-enhancing tumor only, for each patient independently. In this study, we report means and SDs of the correlation coefficients from all 21 patients. Figure 1 compares the simulated total leakage contaminated relaxation rate, ΔR̂*2(t), (Fig 1A) and the component from interstitial leakage, ΔR*2,E(t), (Fig 1B) for various conditions according to the Tofts and Kermode model,14 assuming T1-dominant leakage-associated relaxation enhancement. For the BW model, ΔR*2,E(t) rises with time in the absence of washout. For nonzero kep, there is less rise in ΔR*2,E(t) and closer approximation of the tail of ΔR̂*2(t) to ΔR̄*2(t), reflecting tumors with different contrast agent pharmacokinetics. For kep = 0.1, the tail of ΔR*2,E(t) approaches zero, but because the first-pass of ΔR̂*2(t) differs from that of ΔR̄*2(t), correction of relaxation rate curves at “arterylike” voxels by using K1 and K2 is still required to achieve accurate rCBV estimates. Sample simulated model results for all patients with GBM. 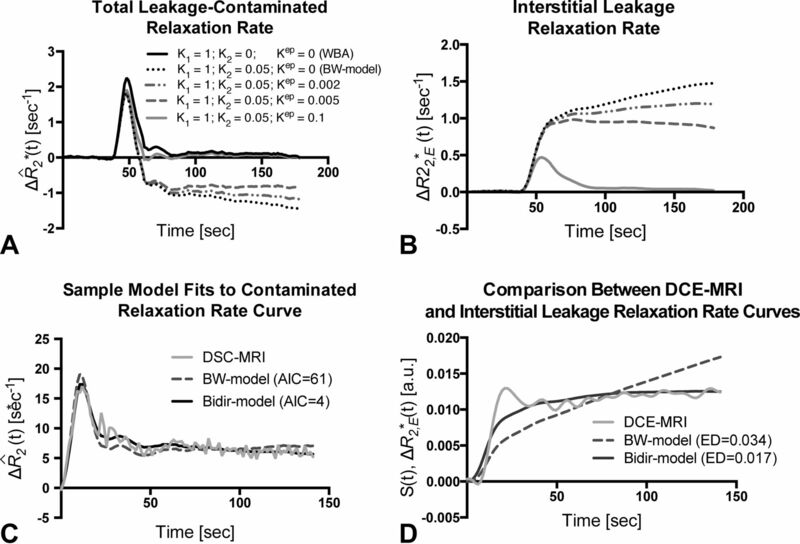 A, Total leakage-contaminated relaxation rate and the component from interstitial leakage (B) for T1-dominant leakage-associated relaxation enhancement. Whole-brain average relaxation rate (WBA) is simulated with K2 = 0 and kep = 0. Kep = 0 with nonzero K2 simulates the BW model. Inclusion of a washout term (nonzero kep) in the bidir model yields less rise in ΔR*2,E(t) and closer approximation of the tail of ΔR̂*2(t) to WBA. C, The bidir model fit to the sample leakage-contaminated relaxation rate curve has substantially improved AIC compared with the BW model for T2*-dominant leakage-associated relaxation enhancement in a patient with GBM. D, The standardized interstitial leakage relaxation rate from the bidir model better tracks standardized DCE MR imaging signal than the BW model for the tumor voxel used in C, with substantially improved Euclidean distance. Figure 1C plots sample ΔR̂*2(t), with T2*-dominant leakage-associated relaxation enhancement for a representative patient, with superimposed BW model and bidir model fit relaxation rate curves. In this example, the BW model overestimates the first-pass curve, underestimates the second and third passes, and overestimates the tail. The bidir model better approximates ΔR̂*2(t) over all time points, visually, and has substantially improved the AIC, quantitating an improved fit to the total leakage-contaminated relaxation rate curve. Figure 1D plots standardized DCE MR imaging signal for the tumor voxel used in Fig 1C, with superimposed standardized interstitial leakage relaxation rate curves, ΔR*2,E(t), from the BW model and bidir model. The standardized interstitial leakage relaxation rate continually rises with time for the BW model, whereas it better tracks standardized DCE MR imaging for the bidir model, with a substantially improved Euclidean distance. 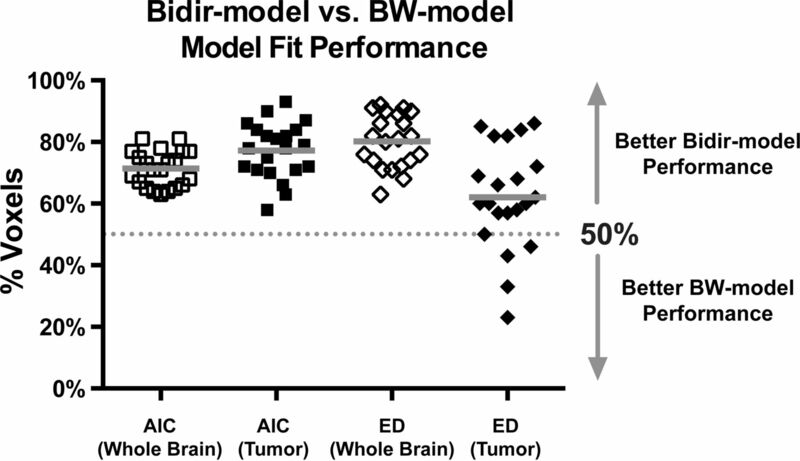 Figure 2 plots the percentage of voxels in which the bidir model outperformed the BW model for AIC and Euclidean distance metrics in whole brain and tumor for the 21 patients with GBM. The bidir model had better AIC performance than the BW model in >50% of whole-brain (mean, 71% ± 6%, P < .0001) and tumor (mean, 77% ± 9%, P < .0001) voxels in all patients, and better Euclidean distance performance in >50% of whole-brain voxels (mean, 80% ± 9%, P < .0001) for all patients and in tumor voxels (mean, 62% ± 17%, P = .0041) for 17 of the 21 patients. All were statistically significant for a 1-sample t test with null hypothesis of 50%. Percentage of voxels (with mean and SD) in which the bidir model outperformed the BW model on Akaike Information Criterion and Euclidean distance (ED) metrics within whole brain and tumor for all 21 patients with GBM. The gray line represents the group mean percentage of voxels. We then performed a voxelwise correlation between the DSC-derived imaging biomarkers from the bidirectional leakage-correction algorithm (kep and rCBV) with the DCE-derived imaging biomarkers (kep and Ktrans). The Pearson correlation coefficient between the 2 kep measurements was 0.74 ± 0.13 across the 21 patients, with a weak correlation between the Pearson correlation coefficient and tumor size (r = 0.11). Figure 3 demonstrates an example of the correlation between DSC- and DCE-derived kep. A correlation test was performed between the bidirectional model–derived rCBV and DCE-derived Ktrans, with a moderate correlation of 0.49 ± 0.22. A moderate correlation was also found between rCBV and plasma volume fraction (vp) at 0.54 ± 0.12. Finally, the correlation between the same rCBV and kep was r = 0.29 ± 0.26. The average Ktrans value was 0.0015 ± 0.0018 seconds−1 (0.09 ± 0.11 minutes−1), DCE Kep was 0.0050 ± 0.0023 seconds−1 (0.30 ± 0.14 minutes−1), DSC kep was 0.0057 ± 0.0042 seconds−1 (0.34 ± 0.25 minutes−1), vp was 0.01 ± 0.01, and rCBV was 1.98 ± 1.24. Comparison between DSC- and DCE-derived kep measurements within tumor. A, Example of anatomic MR imaging of a patient with recurrent glioblastoma. B, DSC-derived kep measurements within the tumor. C, Corresponding DCE-derived kep measurements. D, Scatterplot between B and C demonstrates high correlation (r = 0.92) for this tumor. Note that areas of low kep are similar in both DSC- and DCE-derived maps. Figure 4 compares rCBV maps processed without leakage correction and with the BW model or bidir model, in 2 different patients with GBM, one with T1-dominant leakage (K2 > 0) on average in contrast-enhancing tumor voxels and the other with T2*-dominant leakage (K2 < 0). For all patients, average uncorrected rCBV was 1.98 ± 1.24, the average BW model–corrected rCBV was 1.59 ± 0.89, and the average bidir model–corrected rCBV was 1.35 ± 0.80. The average difference between BW model–corrected and the bidir model–corrected rCBV was 16.6% ± 14.0%. A closer inspection of the T2*-dominant-versus-T1-dominant voxels (as defined by a negative or positive K2, respectively) revealed that the difference between the 2 correction methods in T2*-dominant voxels was 37.7% ± 42.6%, while the same metric for T1-dominant voxels was 5.8% ± 3.4%. Comparison of uncorrected, BW model–corrected, and bidir model–corrected rCBV in a GBM with T1-dominant leakage on average in contrast-enhancing voxels (first row) and a GBM with T2*-dominant leakage (second row). For T1-dominant leakage, mean tumor rCBV is underestimated by using the BW model compared with the bidir model, with the converse true for T2*-dominant leakage. Arrows depict regions of the tumor with large changes in estimated rCBV between leakage-correction models. By incorporating the Tofts and Kermode model into the single-echo DSC MR imaging relaxation rate equation, we developed an improved postprocessing leakage-correction method accounting for bidirectional contrast agent transport between the intravascular and interstitial spaces that commonly occurs in angiogenic high-grade gliomas. Our results demonstrate the importance of considering the interstitial washout term, even when modeling the relaxation rate changes during short image acquisitions. For instance, in the simulation, we observed differences between the bidir model and the BW model fits to relaxation rate data in high-grade gliomas in the first-pass curve (as early as 10–20 seconds after injection). Furthermore, inclusion of a washout term in the bidir model alleviates the error in relaxation rate estimates for arteries and normal brain introduced by conventional models constrained to increasing contrast agent concentration with time in all tissues. Our results suggest that the conventional BW model undercorrects rCBV, with insufficiently increased and decreased rCBV compared with uncorrected rCBV in T1-dominant and T2*-dominant leakage scenarios, respectively. Furthermore, because the low flip angle DSC MR imaging protocol was largely T2*-dominant and the largest discrepancies between the bidir model and BW model estimates of rCBV existed for T2* dominant voxels, our results suggest that the bidir model may be particularly advantageous over the BW model for correcting the residual T2* effects frequently encountered in dual-echo gradient-echo acquisitions. This algorithm can be performed without a substantial increase in postprocessing computation time over the unidirectional model; therefore, the bidirectional model can simply replace the previous model in routine clinical work and for evaluating tumor grade, distinguishing pseudoprogression from true progression, and evaluating treatment response. Bjornerud et al25 proposed a method that reduces the sensitivity of rCBV correction to mean transit time that could be combined with the bidir model scheme. Most interesting, Schmiedeskamp et al23 used a multiecho, gradient-echo, spin-echo acquisition scheme to correct for T1 and T2* leakage by using a backflow term; however, results were highly dependent on literature values for r*2,E and r*2,P, the T2* relaxation effects of gadolinium in the extravascular space and plasma, respectively, which can vary quite substantially depending on the literature source. Additionally, Quarles et al17 suggested that these values could vary from tumor to tumor, depending on physiologic factors such as interstitial, vascular, and cell volume fractions and vessel and cell size. An advantage of the bidir model correction method is the lack of assumptions for r*2,E and r*2,P. All of these leakage-correction algorithms aim to isolate the relaxation rate due to the residual intravascular contrast agent by eliminating the T1- and T2*-related contributions to the relaxation rate from the extravasated contrast agent. They do not “add back” T2* relaxation that would have been realized had the extravasated contrast agent not left the plasma space, so “corrected rCBV” may still differ from that computed for a tumor with no vascular permeability, all other parameters (including true blood volume) being equal. One potential limitation to this study is its retrospective design, which may have yielded a selection bias in the sample. Specifically, all patients were chosen because they failed standard therapy. Another potential limitation is the lack of correlation with a criterion standard, such as histology, or with CBV estimates by using intravascular agents such as iron oxide contrast agents. Moreover, AIC is a unitless quantity, which can compare relative goodness of fit between models but does not have a direct test to determine whether one model is significantly better than the other. Finally, the current study only included patients with glioblastoma; therefore, we were unable to recommend a threshold between low-grade and high-grade gliomas by using the new leakage-correction algorithm. The bidir model more accurately corrects for the T1 or T2* enhancement arising from contrast agent extravasation due to blood-brain barrier disruption in high-grade gliomas by incorporating interstitial washout rates into the DSC MR imaging relaxation rate model. To this end, the bidir model may potentially improve patient diagnosis and evaluation of treatment response by more accurately estimating rCBV in DSC MR imaging. Disclosures: Timothy F. Cloughesy—UNRELATED: Consultancy: F. Hoffmann-La Roche; Genentech; Celgene, Tocagen, AbbVie, Novocure, StemCycle, Novartis, Nektar, Newgen, Notable Labs, Upshire-Smith, VBL. Albert Lai—UNRELATED: Consultancy: Genentech, F. Hoffmann-La Roche, Novocure. Linda Liau—UNRELATED: Grants/Grants Pending: Northwest Biotherapeutics,* Comments: research grant. Whitney B. Pope—UNRELATED: Consultancy: Guerbet. *Money paid to the institution. This work was supported by the American Cancer Society Research Scholar Grant RSG-15-003-01-CCE (B.M.E. ); National Institutes of Health/National Cancer Institute R21CA167354 (B.M.E. ); UCLA Jonsson Comprehensive Cancer Center Seed Grant (B.M.E. ); National Brain Tumor Society Research Grant (B.M.E. ); Siemens Healthcare Research Grant (B.M.E. ); Art of the Brain (T.F.C. ); Ziering Family Foundation in memory of Sigi Ziering (T.F.C. ); Singleton Family Foundation (T.F.C. ); Clarence Klein Fund for Neuro-Oncology (T.F.C. ); National Institutes of Health National Institute of General Medical Sciences training grant, GM08042 (K.L. ); and the University of California, Los Angeles Medical Scientist Training Program (K.L.). Accepted after revision January 28, 2016.